Program #CULT021. Recorded in New Delhi, India on January 1, 2004. This recording features a majestic rendering of the late night raga Kaunsi Kanhra. A combination of Darbari and Malkauns raga, Sitar maestro Chaudhuri has a particular affinity for this raga and his performance is marked with great sensitivity. The meditative alaap, opening of the raga, almost 30 minutes, is followed by two compositions in teental, a 16-beat time cycle. The recital concludes with a dhun, a light classical style, based on Mahatma Gandhi’s favorite, bhajan, Hindu devotional song. Maestro Chaudhuri is accompanied by tabla master Shafaat Ahmed Khan, a brilliant exponent of the Delhi gharana, school of tabla playing. He passed away in 2005. 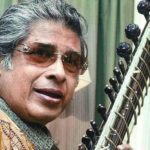 Winner of the Padma Bhushan, one of India’s most prestigious awards, Pandit Debu Chaudhuri, is a legendary figure in Indian classical music. He is a disciple of the great sitar master, Ustad Mushtaq Ali Khan of the Senia Gharana, the traditional school of Indian classical music named after Tansen, the father of Indian music.